Livorno, the third day of the Italian gullet and again up at 0600 and breakfast at the International cafe we gave up on room service, we were to meet the van by 0800. The sun was just slithering above the horizon as we boarded our van and the clouds that had followed us up the Italian coast line began to part. GOOD! 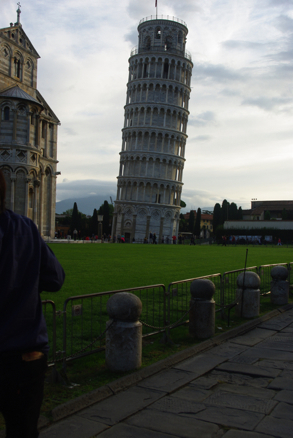 We headed directly to Pisa to visit the leaning tower and take lots of photos. Half of our group had never been here. So we did that and then our driver that the Verrazano winery was closed and indicated he would locate another winery for us to lunch at. Definitely a communication problem! Well we thought we sorted it out, as he said we could still see the castle, so he drove us on to the Verrazano wine sales location and did buy wine, only the estate was also closed and that by going there we would now miss our reservation time for the museums in Florence. Not Good! Well, we made it clear that lunch was not important and that all the museums and churches were. So we were off, the sun was in full bloom and the air was fresh at 70 with a gentle brisk breeze! Excellent for walking and taking pictures. 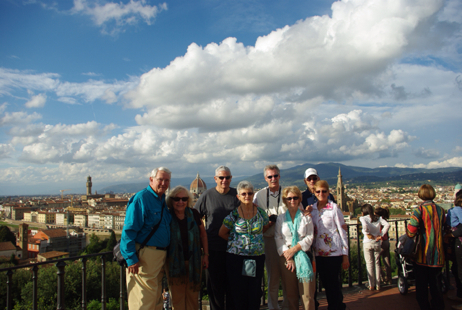 The rest of the group, were able to get into the Accademia, and see David, so they were now happy. Later we found a small pizzeria for sandwiches and Cindy and I split one and had a beer each, and the others had pizza. On to the Ponte Vecchio where Val bought some nugget candy that she Haden's had sense she was in England. Then we drove up to the top of hill that I can't remember the name of and got some great shots of Florence.